Beautiful certificate from the McNutt Non-Explosive Manufacturing Company issued in 1908. This historic document was printed by the U.S. 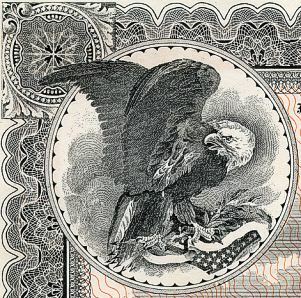 Corporation Company and has an ornate border around it with a vignette of an eagle grasping a slope with the American flag. This item has the signatures of the Company’s President, John J. Kirby and Treasurer William E. Rocke, and is over 101 years old. 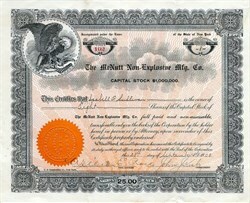 The Francis H. Richards gold medal was awarded to the McNutt Non-Explosive Manufacturing Company (McNutt patents).
" If that man's going to light up some gasoline, he'd better build an iron cage, or else I'll have to get out," remarked an exhibitor at the exposition, as he saw a demonstration of pouring lighted gasoline from one container into another lighted receptacle. But the safety device worked and the speaker soon felt that he was perfectly safe. It was this device of the Non-Explosive Safety Naphtha Container Co. that was awarded tin F. H. Richards gold medal for the most meritorious device for safeguarding auto boats and auto vehicles, using gasoline. Tin- device consists of a double fold of thin brass plate punctured with a mesh of fine holes. The volatile liquid burns at the vent, but the flame can not reach the substance in the container; the can is fitted with a fusible plug, which melts at 300 degrees F., thus allowing the liquid to burn at the vent and preventing an explosion."